START FIRES EASILY: Strike sparks up to 16,000 times at over 5,500°F using an industrial strength Magnesium Ferrocerium rod built for outdoor emergency survival, bush craft and fire starting in all weather conditions. ★ GET 2 FIRE STARTERS (Army Green Color): Each box includes 2 Army Green Fire Starters to ensure you are always prepared. 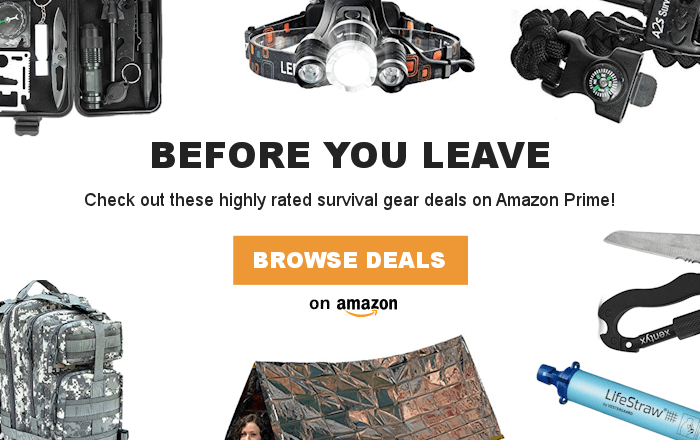 Place one in your survival kit, bugout bag, camping backpack, first aid kit, car glovebox, Boy Scouts’ gear or give one as a gift to the outdoor enthusiast. STAY SAFE: Each fire starter is a 5-in-1 multi-tool that includes a built-in navigational compass, an extremely loud 150dB whistle, a large steel scraper and a heavy duty 450LB 8core Paracord made for extreme survival. 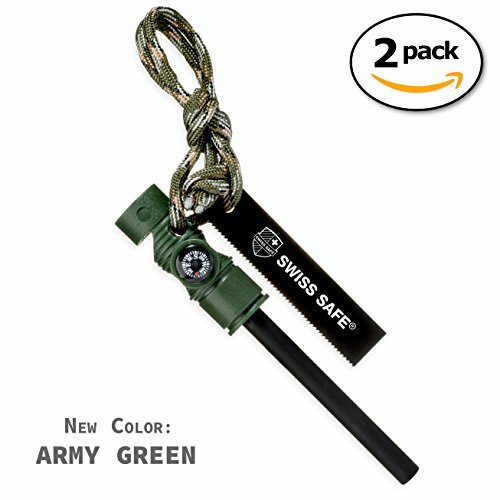 ★ Get 2 Swiss Safe Fire Starters Per Package! ►PREMIUM CONSTRUCTION – A high quality firesteel is used to create spark showers at 5,500 º F, can be used in any weather condition, waterproof, rain proof. Swiss Safe fire starters are built for the harshest conditions and offer maximum durability. ► 5-in-1 SURVIVAL TOOL – Five functions in one fire starter helps to keep you warm and alive! (2) Steel Scraper – Duel function scraper is used to scrape magnesium from rod with jagged end, then use pivoted edge to ignite hot sparks of fire! 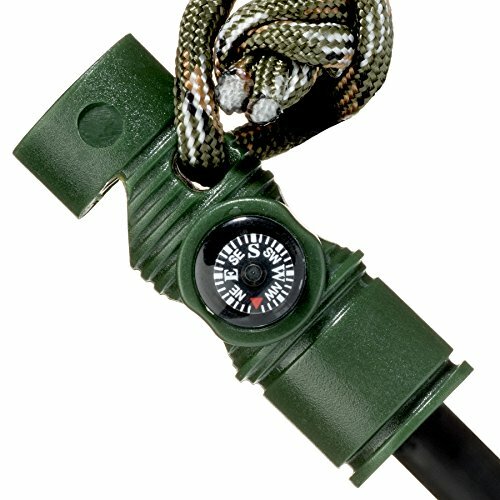 (3) Built-in Compass – Small compass is fixed into handle of fire starter offering navigational tool. 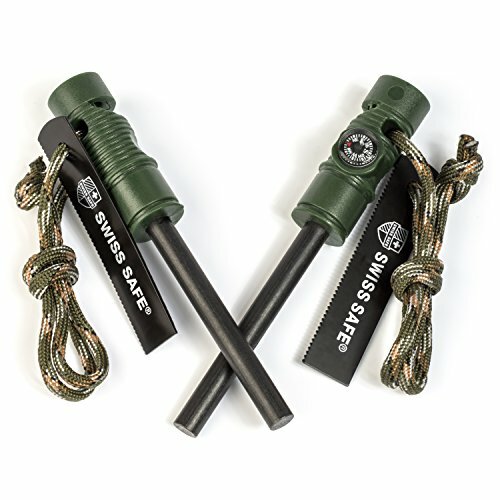 (4) Survival Whistle – Each fire starter has a 150Db whistle built into the handle of the fire starter. (5) 450LB 8core Paracord – Get 55cm of black military Paracord which can used in dozens of ways in survival. ► Swiss Safe Guarantee – Swiss Safe is trusted around the world for providing premium quality First Aid Safety and Survival Equipment to outdoor enthusiast. Customer satisfaction is very important to us, if you are unhappy with your Fire Starter for any reason, you will receive a complete refund, no questions asked! Buy Now and receive Swiss Safe’s 100% Money-Back Guarantee! BETTER THAN FLINT: Don’t be left out in the cold. Our Magnesium Ferrocerium rod is more dependable and effective than flint firestarters, matches, and the common butane lighter. Each Firestarter is 5″ long, with a sturdy handle, and weighs only 2 ounces. Wear around your neck, tie to hiking gear or fit into your pocket. 100% MONEY BACK GUARANTEE: Customer satisfaction is very important to Swiss Safe, if you are not completely satisfied with your purchase, we’ll refund 100% of your money, no questions asked!